Visiting Hong Kong for our surprise is one of the most diverse countries that we actually loved while traveling to in Asia. During our travel to Hong Kong and Macau, we were able to not only see the grandeur of the city. But we were also able to see much of its local side – something we love to see in any part of the world we travel to. Today we will write about budget travel in Hong Kong. Hong Kong is situated on the southeast coast of China and is by far the favorite city of almost everyone in the world with more than 20 million visitors each year. Hong Kong is also considered as the world’s richest city, since it has the most billionaires in the world per capita. It has more skyscrapers than any other city including New York! 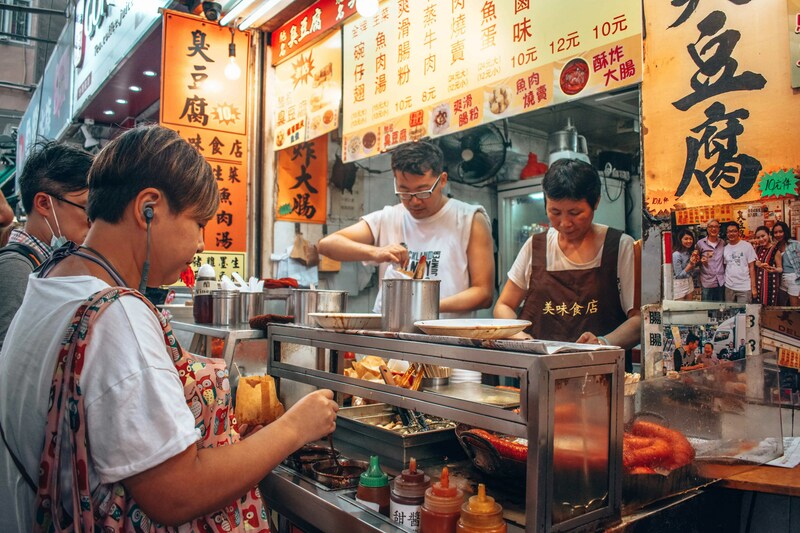 Read here most instagrammable places in Hong Kong! A lot of tourists come to Hong Kong for it has one of the cheapest air fares especially if you’re from the Asia. There are a lot of airlines that fly to Hong Kong such as Swiss Flights, Air Asia, Singapore Airlines flights and many more. You can book your flight to Hong Kong with Skyscanner. We went on a flight from Clark International Airport since we are based in Angeles City and prices were so affordable! Hong Kong’s wet season is from February to March where it becomes warmer and humidity starts to rise. The best time to visit Hong Kong is from October to early December when the weather is sunny, chill, and just comfortable. The best shopping season is during Christmas sales to Chinese New Year. Click here to know more about the weather in Hong Kong! Great news for Nationals of the US, Europe, Australia, Canada and New Zealand no need a visa for stays of 90 days and 180 days for UK nationals. So it was perfect for us, Rachel with her Filipino passport was able to get 14 days free Visa in Hong Kong. Click here to know more about the visa policy in Hong Kong. The official currency of Hong Kong is called Hong Kong Dollar. And $1=7.8 HKD. ATM’s are available all throughout the country. They accept credit cards almost everywhere in Hong Kong. You will use cash to buy street food and small things. There are many points around the city where you can exchange money in Hong Kong. You can access the internet everywhere in Hong Kong. You can access in Cafe’s restaurants and some tourist spots that offer free WiFi. You can access WiFi in hotels and accommodation. There are Tourist SIM Cards in Hong Kong for 5 days and 8 Days with 5 GB and prices are 88 HKD and 118 HKD. You will have unlimited voice calls and you will be able to connect Wifi almost everywhere in the city with the SIM Card. Everything go really fast in Hong Kong and lunch time is the same. Restaurants are very small and they share the space in the most efficient way. We liked so much the local food. As you can see in the pictures, you have to get use to use chopsticks. 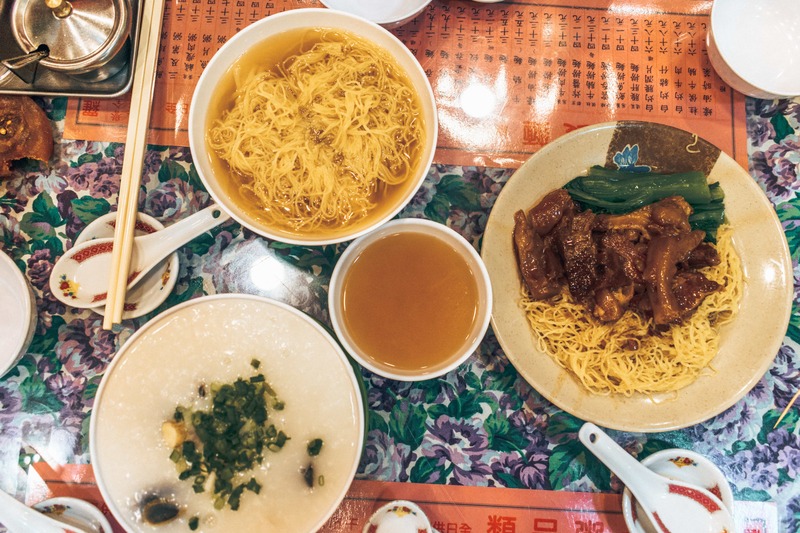 A total of $5-6 dollar can be your food budget in Hong Kong per meal in a local restaurant. You can go cheaper with street food and also higher of this budget if you visit fancier restaurants. Beers and drink can be expensive in bars and restaurants. But you can get beer for $1 in the supermarket or 7 Eleven. Click here to know our favorite street food dishes around Southeast Asia. If you’re looking for a cheap place to crash, there are dorm rooms in Hong Kong that only go for $25 or less. Another inexpensive lodging option is AirBnB, where you can get rooms for $40-50. Click here to get a $30 USD discount on your first booking when you sign up on AirBnB! Those who want to treat themselves can always book luxury hotel rooms starting at around €200 per night. Planning to book accommodation for your next trip to Hong Kong? Click here to book with Booking and Agoda! Most of the things to do and see in Hong Kong are for free. You will have to pay just a bus ticket, ferry ride or a metro ticket which would be around $1-2. There are free museums and also temples are free of charge. You can save money going hiking to the Peak instead getting the tram! But if you wish more comfort and you want some is organizing for you joining tours can be $30-40 per person. The cheapest way to move around is by bus where you can get rides for $1. Metro is the easiest way to move around and it depends on the distance can be $1-2. There are boat and tram rides in neighborhoods that will cost you less than a dollar. You can use taxis if you want more comfort to move around Hong Kong but prices are expensive. You can spend $40 per day in Hong Kong, sleeping and eating comfortably included! If you are traveling as a couple. You can even spend less than $20 each in accommodation or you can book a better place if you have more budget. In local markets, you can find noodle soups, fried rice for $3-4. You can find a 7-Eleven store anywhere and supermarkets where you can buy snacks and drinks for very cheap prices. Transportation to move around Hong Kong is cheap and luckily there are not many entrance fees around sightseeing in Hong Kong.